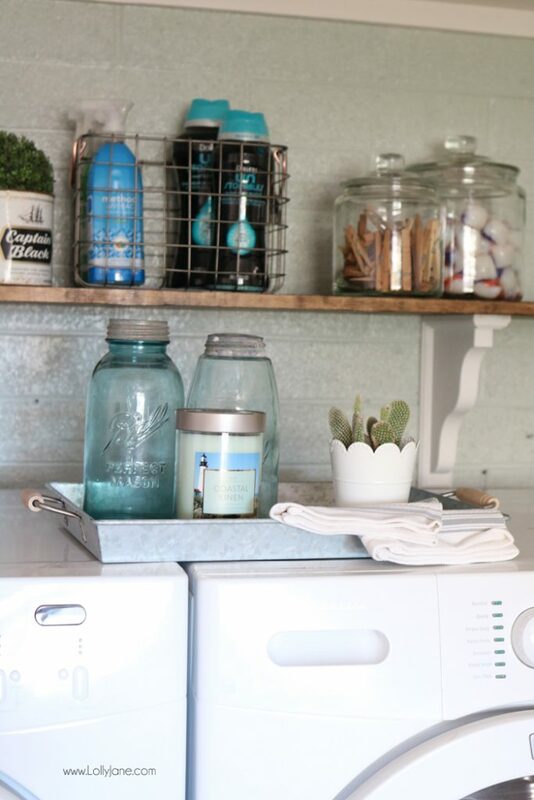 You may remember a sneak peek of my farmhouse laundry room refresh I shared a few months ago and it’s finally time to reveal the whole space… that we refreshed for less than $300! If you’re a longtime follower you’ve seen me spruce up my old 1970’s farmhouse room by room… little by little… on a budget, of course. 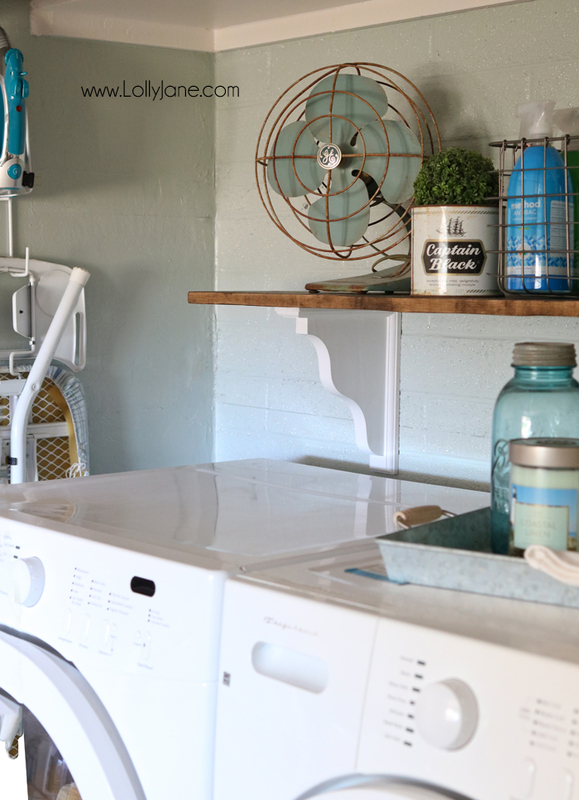 😉 Besides our craft room makeover, dining room and porch refreshes, we’ve finally put some attention on my much neglected laundry room! 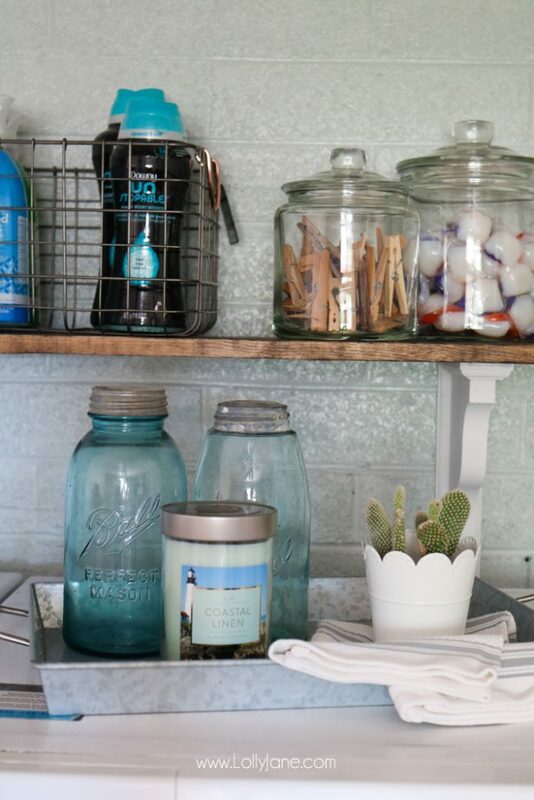 Succulents have become our go-to accessory for each room in the house so we paired a prickly cactus in a scallop tin and it adds a touch of home to the space. 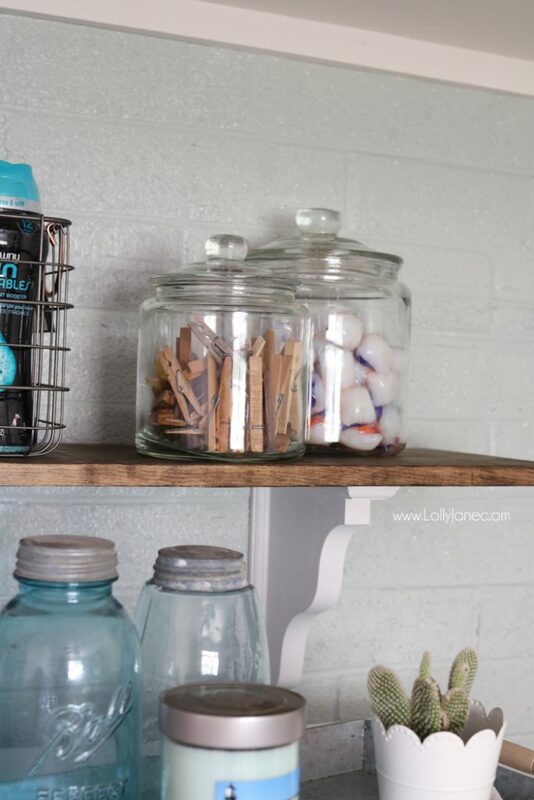 Adding laundry soaps, sprays, and other cleaning supplies in baskets and clear jars on top of our DIY Farmhouse Shelves makes cleaning organized and still pretty! 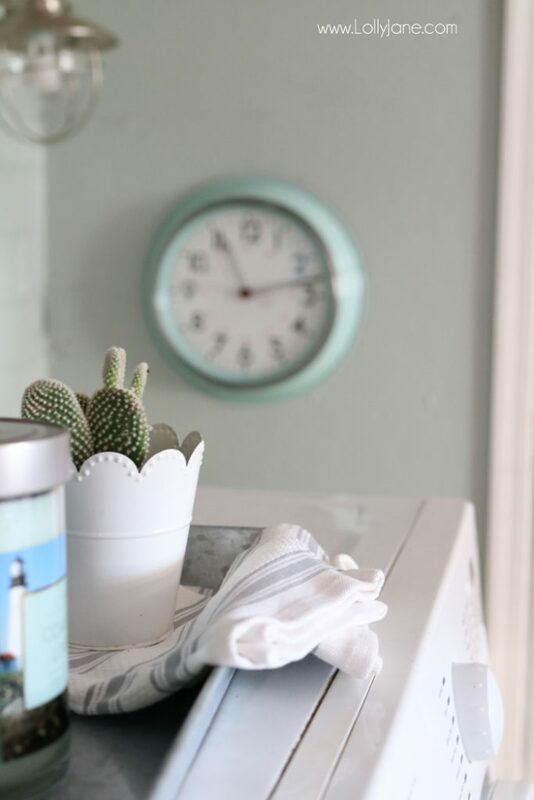 Of course adding some touches of decor like my vintage fan, tobacco can with a faux succulent, and flowers in the sink really make the space homey and warm… pun intended. Haha. I hung my ironing board on one side of the washer and a blank space on the opposite wall houses my larger cleaning supplies like my mop, duster, and Swiffer vacuum. What do you think? 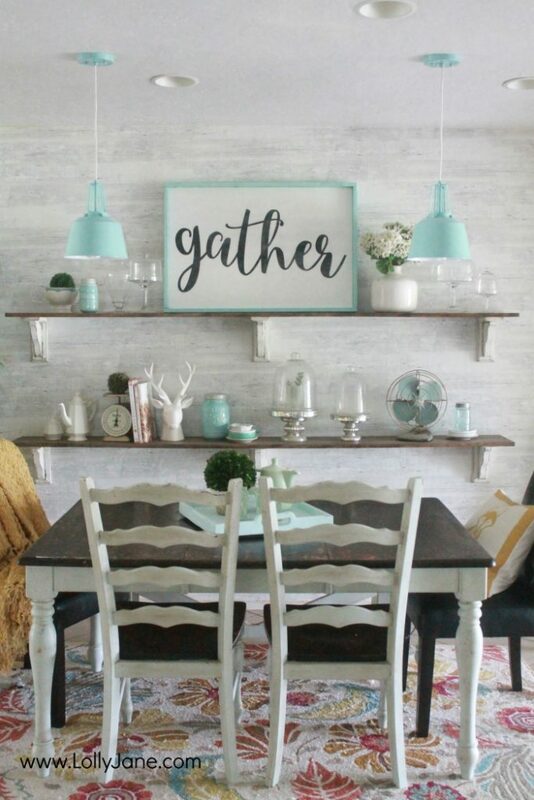 I know this space needs a major overhaul but in the meantime, it’s amazing what accessories and paint can do! 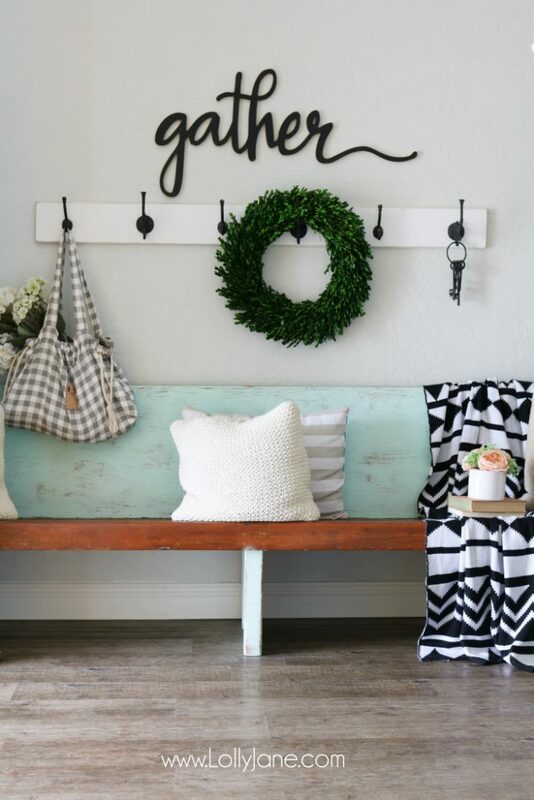 or our popular DIY Farmhouse Shelves! 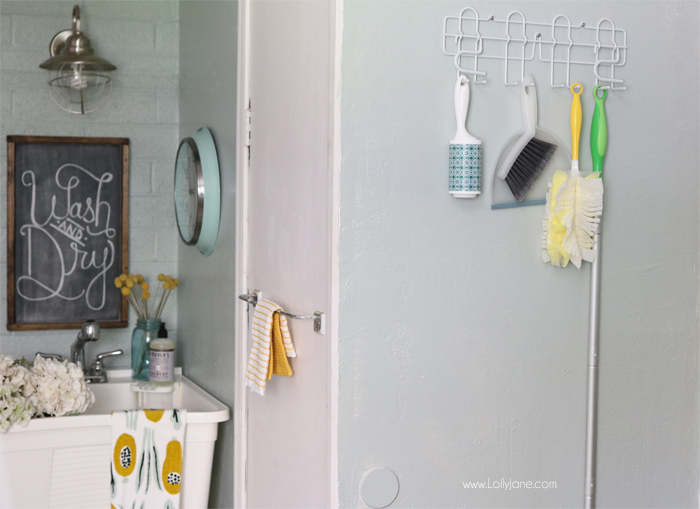 Such refreshing colors in your laundry room! I love it! Dare I say that your space would make me want to do laundry??? hey girl- so cool! Love the room! hey girl- so cool! Love the room!. What a cute makeover! I especially like the light, the clock, and the jars. 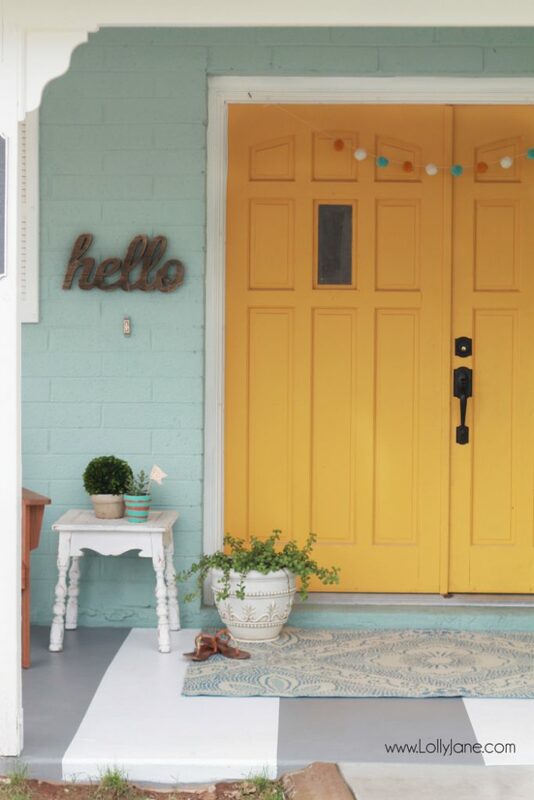 Love the pops of yellow against the muted aqua wall color. Soooooo “slump block” …… what we call cinder block or concrete block? I found that very interesting. Your makeover gives me hope. My laundry is in the basement but has only the exterior wall. I Have to get 3 more walls built. sigh….. Maybe one day. I love what you’ve done and am pinning it to my laundry dream board. Laundry might actually be fun in a room like this! For only $300 it looks like a million bucks. So cute! It has to make laundry day so much more pleasant! 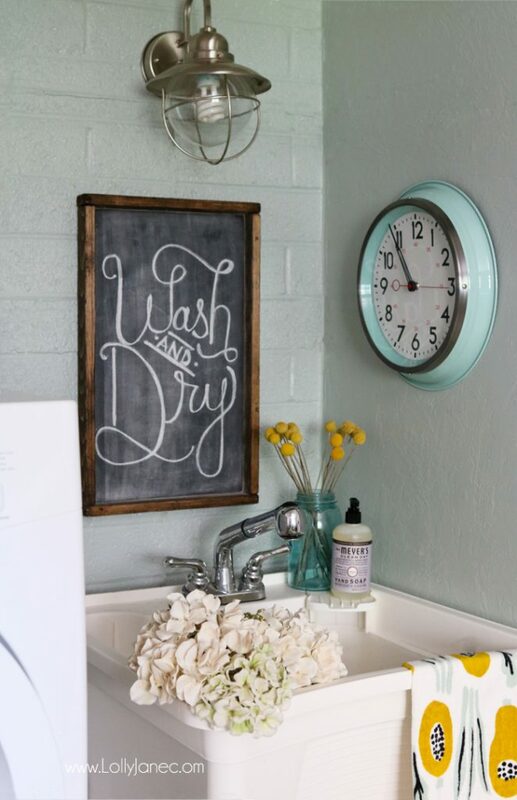 I love your clock and that you tucked your detergent packages in a pretty glass jar! Thanks so much for sharing at Celebrate Your Story! 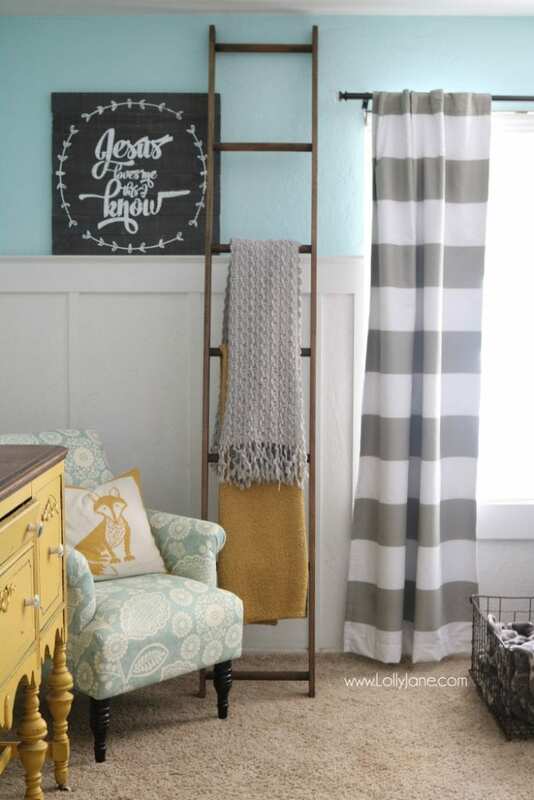 My least favorite thing to do is the laundry but your space may make it enjoyable! 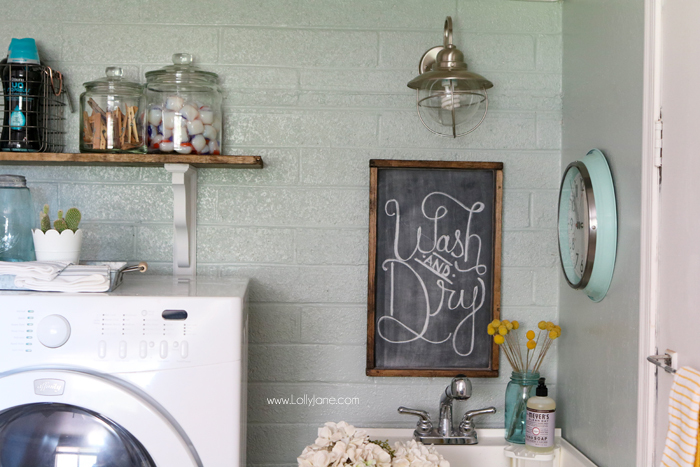 Loving the Laundry room update , I adore the vintage feel and that sink !! I really love your new laundry room. I think I could get excited about laundry in there!! So many fun things in this room. I love the vintage feel! Thanks for sharing with SYC. 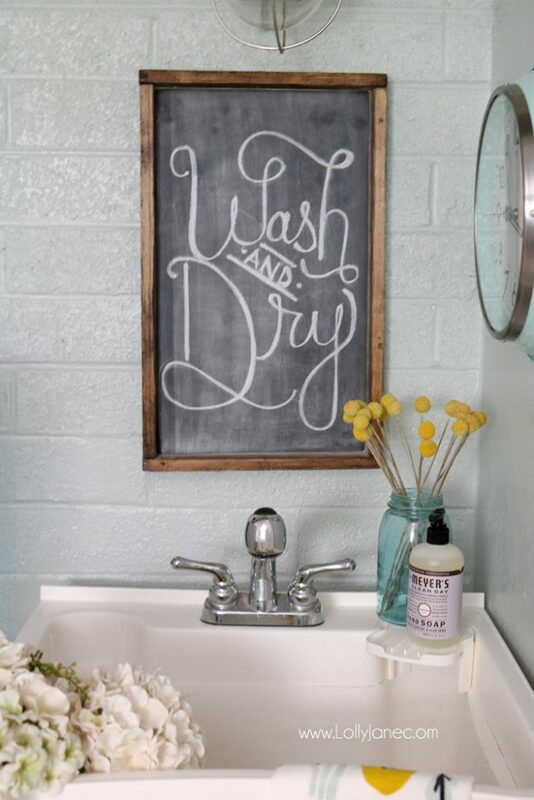 Your laundry room is so sweet. Thanks for sharing at Over The Moon Party. What an adorable make-over!! Love that wall colour too. 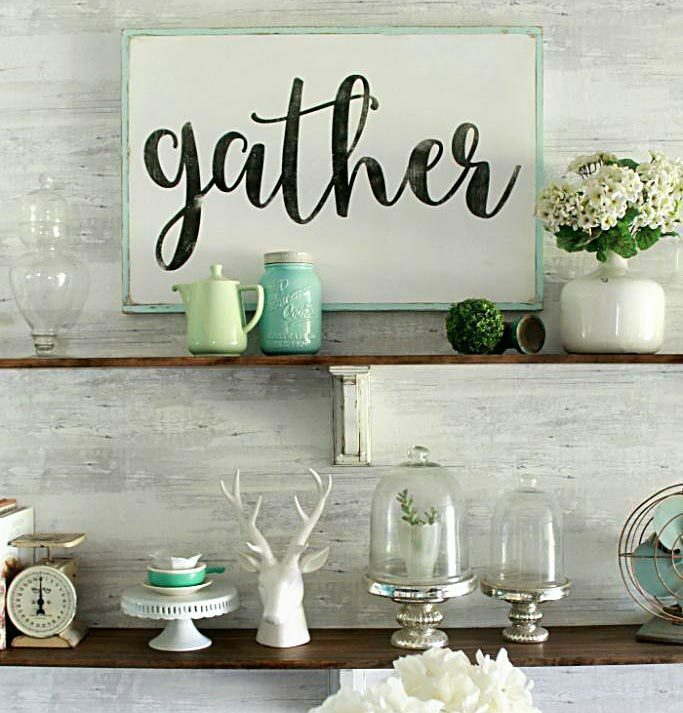 Thank you for sharing at Create, Bake, Grow & Gather this week. I’m delighted to be featuring your budget laundry make-over at tonight’s party. Pinned also! Gorgeous refresh! 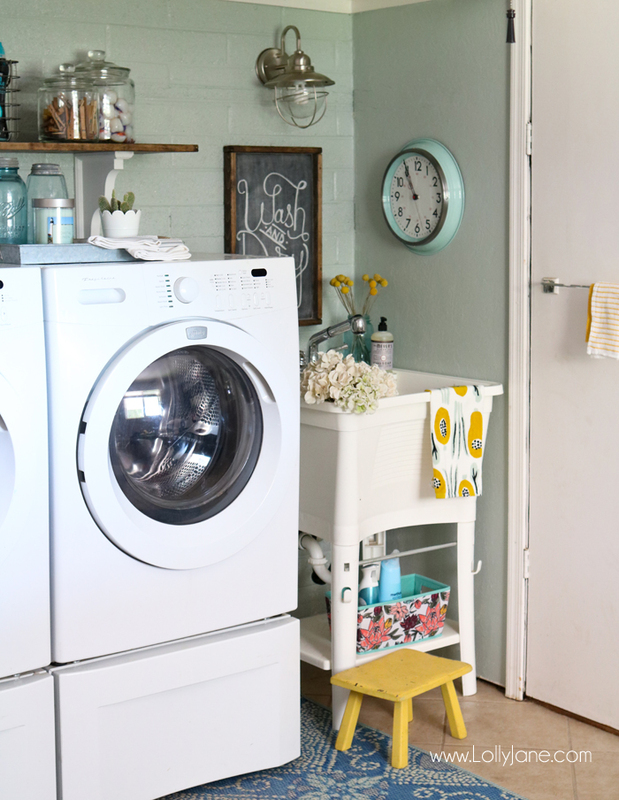 I am definitely inspired to rethink my laundry room. I spend so much time there I might as well make it a place that is beautiful and enjoyable. Pinned and sharing. Thank you for joining us at Family Joy Blog Link-Up Party. I hope you will join our next party starting Sunday at noon EST. wow so pretty! A room I would not mind finishing up my laundry in. I can’t wait to tackle mine! You’re welcome to share my washer/dryer anytime 😀 LOL, thanks, Amy! What a fantastic laundry room. It might make you want to hang out there! 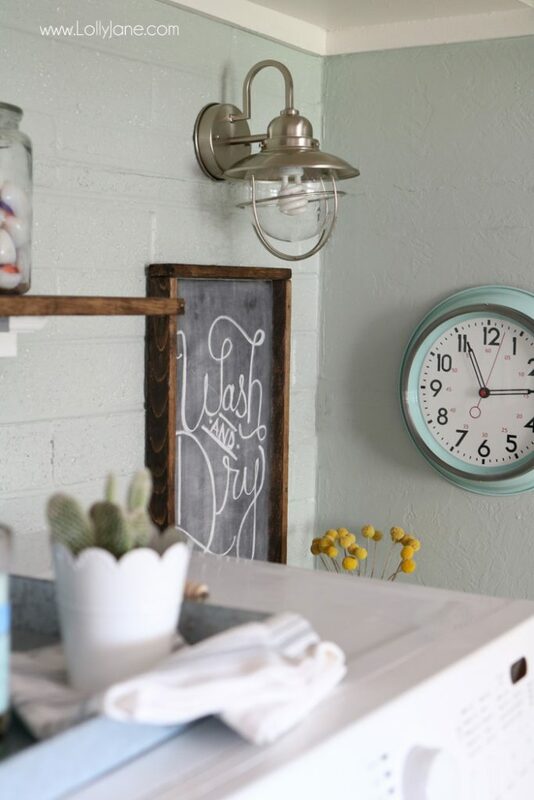 Very cute laundry room!! going to try some of your ideas!